People come from around the world to shop at Japanese game stores. Yet, in the country, some worry that those specialty shops will vanish. One insider even thinks video game shops will vanish in the next five years. On website Gekicore Gamelife, game retail employee Osho writes about how tough business has been for brick-and-mortar video game shops. 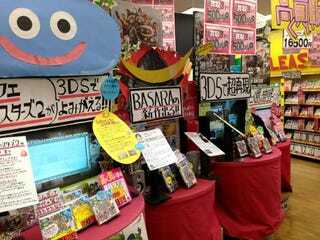 Osho does sales promotion for Tokyo video game specialty shop Pao, which has locations across the city. As Osho points out in his article, among other things, small shops in Japan are seeing profits decrease due to digital game sales, which are reducing the number of packaged titles sold. Amazon and other online retailers are also hurting small shops' bottom line. Osho points out that obvious fact that managers in retail aim to make a profit—hence the problem. Of course, this isn't unique to Japan as retailers in other countries are having a tough go, too. "Real-world 'game specialty shops' will not survive [in Japan]," Osho writes. "It seems like they'll completely vanish in the next five years." Note that Osho is referring to these "game specialty shops" as "geemu senmonten" (ゲーム専門店), meaning that they only deal in video games. This is important because Pao refers to itself as "Video Game Specialty Shop Pao" (an important distinction, because, as Osho continues, he explains that video game stores will sell more trading cards, toys and figurines, because of simple economics. He points to Pao as an example. This Pao branch introduced a trading card section this past summer. "If there is a reason to come to your shops, then the increase in customers is directly tied to the resulting profits," Osho writes. That reason, it seems, is no longer only video games, because people don't need to come to stores anymore. And thus, this is what will end the specialty shop. Personally, I think the video game specialty shop will survive, but it will be a combination of some new games and mostly older, used, and rare games. In Japan, they'll be more for collectors, and there are already numerous stores like this. I don't think they'll all vanish. Brick and mortar shops like Super Potato, which have an incredible stock of used games and consoles, will stick around. But some of them could move to online only. I've already seen stores near where I live start making the shift from mostly video games to the seemingly more profitable trading cards and merchandise. I don't expect that to stop anytime soon, especially not when it's so much easier to download or order online than getting up off your duff and leaving the house. That's the era in which we live.